This page has a total of 22 images, as of 28.03.2019 (21:56:09). This view of the 'still using the railroad' side of the Independence Mine, the old Stratton Independence Mine, is a nice one for the most part but sadly, it is a copy of another source image, so it lacks in the details part and it has issues with not being sharp/clear on the sides. Located on the more lower part of Battle Mountain, Independence mine used to have an Ore-House in this area and as we can see, there are also visible left-overs of the Huge Mill complex that also used to be located at this site, seen with all those concrete blocks and such seen poking up of the ground. 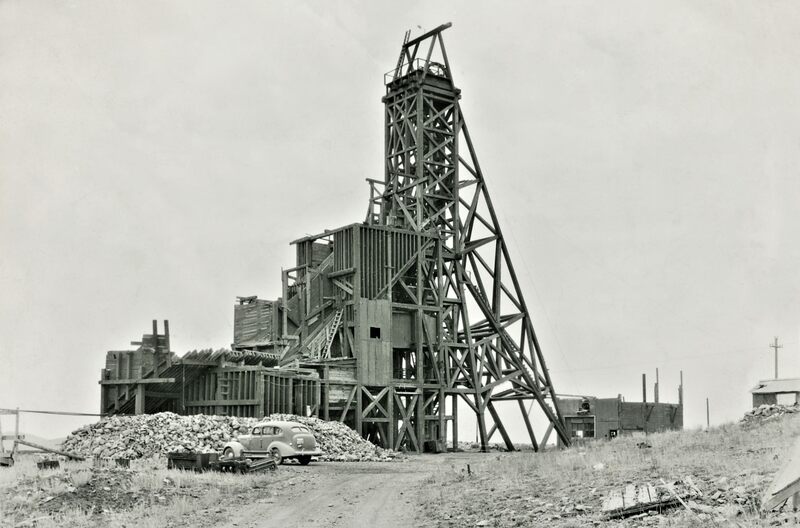 I have a 1965 slide image showing the Headframe and a trestle poking out that match this view quite well even if they are from different angles; from the chute seen about middle top/down and about 1/3 in from right-hand side to the old Tunnel Portal seen almost 1/3 up from bottom and about center sideways. 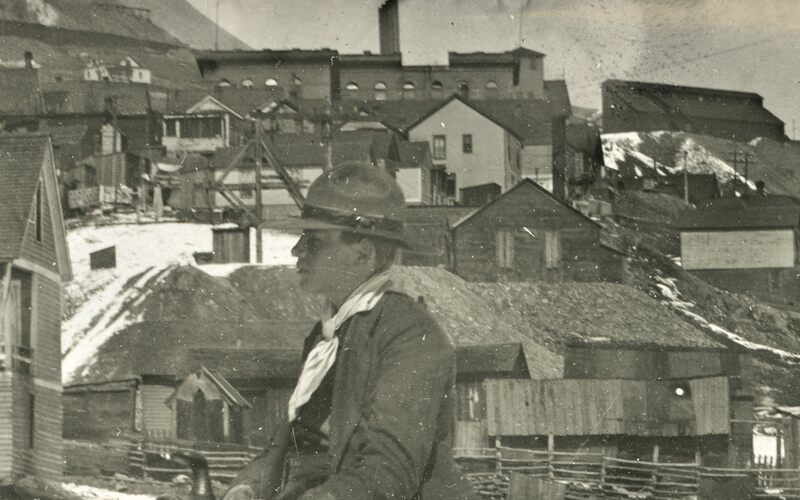 In background left top the town of Goldfield can be seen, visible with both the City Hall and the Church who lined Goldfield's Victor Avenue. I also see the huge former Short Line fill in southern Goldfield area, where the cut where trains and Trolleys used to come out from is located about 1/5 down from top and about 1/7 to 1/8 in from right-hand side. The whole structure is quite massive, and all in wood it appears! Hard to imagine all this at one time enclosed in a massive Shaft-house type of structure, as I assume this is as it was built inside the structure back in the days. The left most parts, with the various bins I do think is more recent then the headframe itself, but I dare not say anything as this is beyond my knowledge. Quality wise is this not a good image card with scenes from the Cripple Creek District, but, it still is one among the many hundred scenes used for postcards with links to the District! The two views; the Independence Mine on the left side and an unknown Prospect Shaft on the right-hand side is really showing the span of the reason for the whole District. It could go from right to left – from hoping to hit the jackpot, to actually find it – or it could go the other way, from rich to poor. Neither views are that good due to the nature of this printed card, but still I wanted to share it, and possible, one day I learn more about the view on the right-hand side… Till that might happen, I only share as a link the left view, the Independence Mine, as a cropped 600 dpi view on my weblink below. 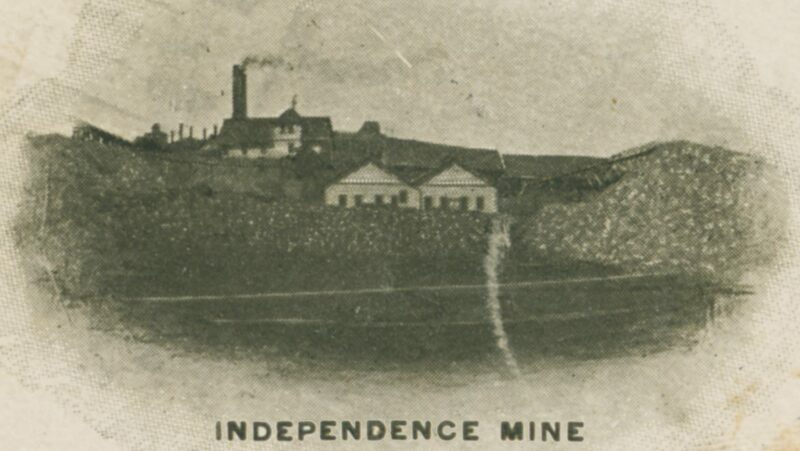 Postcard; Published by unknown; titled Independence Mine | Prospect Shaft - Published in ????. Card has a bad curve to it making it a little bit hard to scan as it will not lay flat, also it has a somewhat faded look, but I have enhanced it a little and use that copy here. No info given about the occasion for this people gathering. Some handwriting on the backside but that is done years later as it gave wrong info about what is in this scene in terms of mines seen. Near impossible to scan readable as I need to twist the card against the light to be able to read it by eye on card itself, and some is so faded I can't make it out against the dark card backing. * Scene is at the F. & C.C. 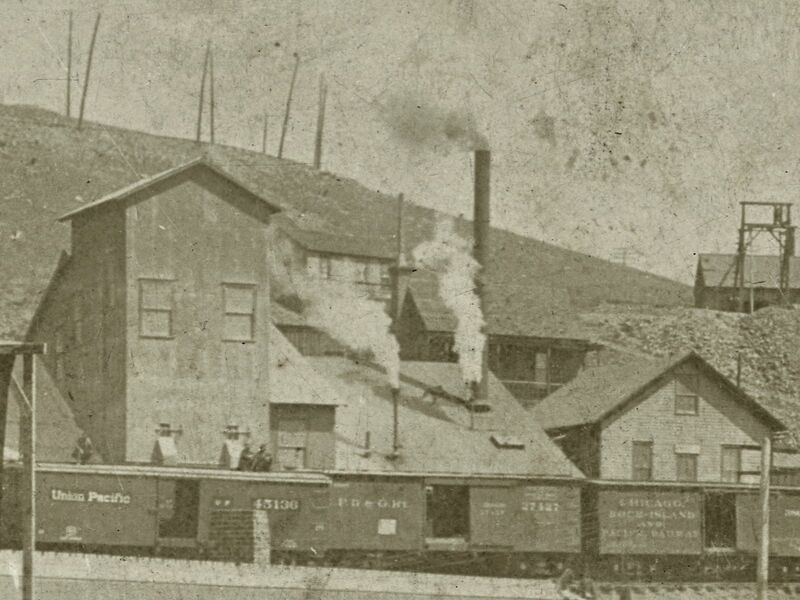 Depot Grounds in Victor, roof of the Depot is seen on left-hand side, and that gives this to be the newer depot, the one from after the 1899 City fire. 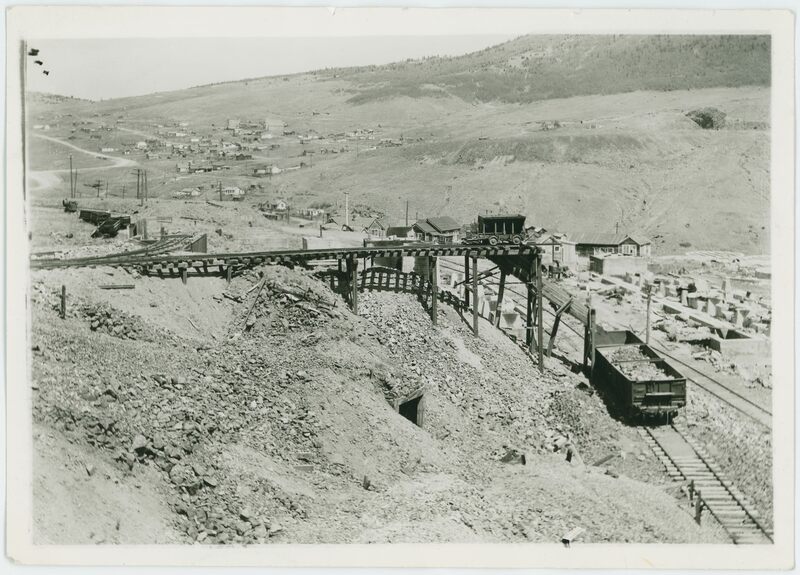 To the right-hand side of the depot/image part is seen a prospect type of operation, as there is seen one head frame and one structure hiding behind the Denver & Rio Grande Passenger Cars making up the passenger train part of this view, as far as I can tell they are part of the Mary Cashen Mine operation, before they made the huge dump behind a large crib-wall seen in many Victor views. 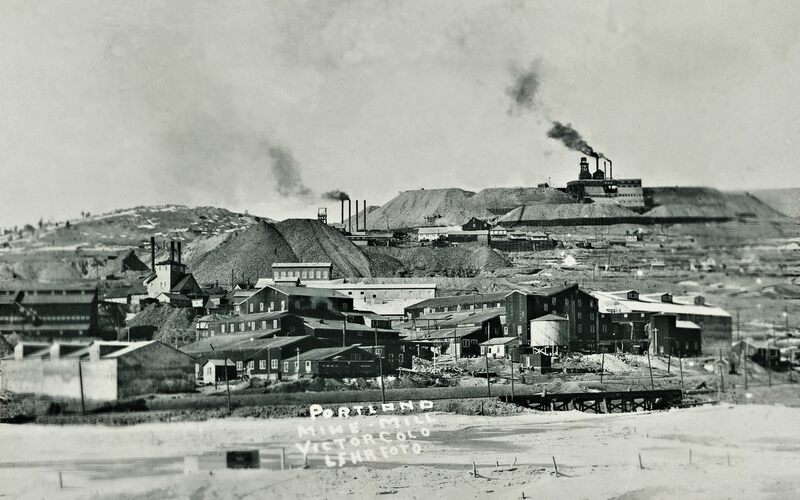 At first I thought this was an early view due to the headframes seen, but have realized it is possible into 1900 or maybe a year or two later into the century. 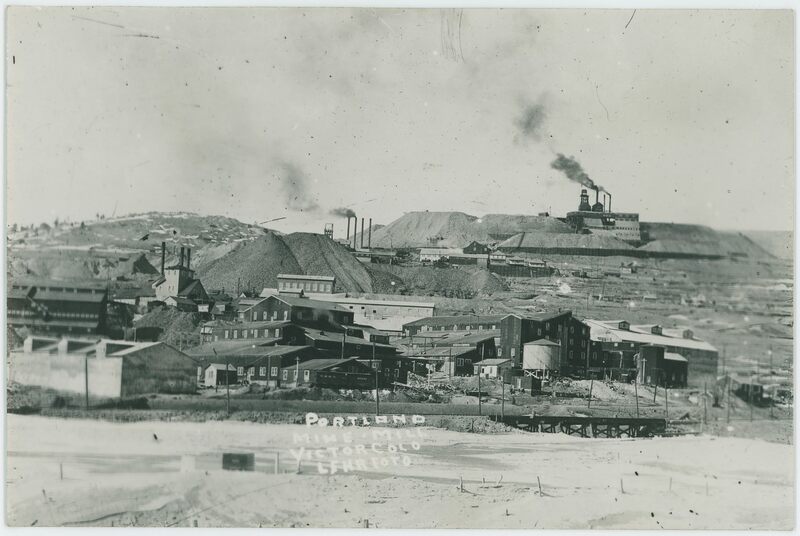 * The Mine seen with its Head Frame towards the photographer, on the dump near middle top, is one that puzzles me as I can't fully make out if it is on the W.C. Dillon or on the Strong claims. 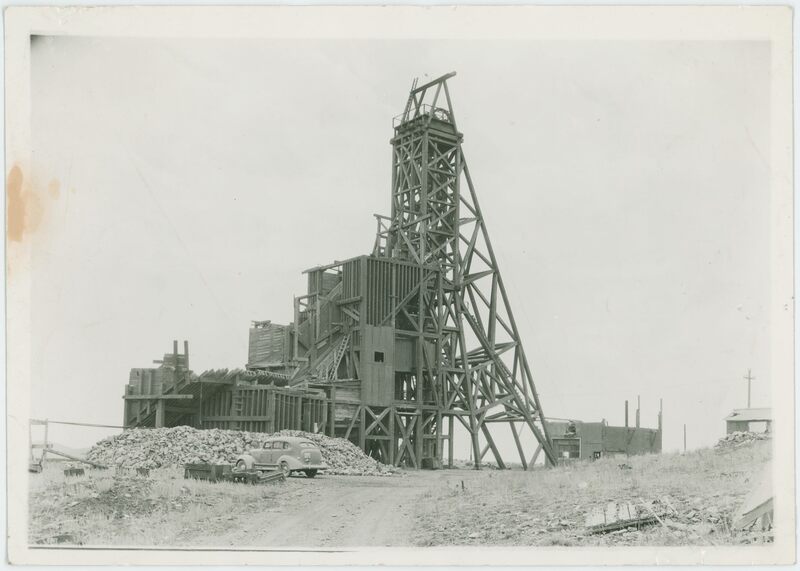 It seems to be a small operation, with a hoist house behind it, seen in many views of this area, and I have started to think it is a smaller shaft of the Dillon mine, but might very well be a totally different mine at all. 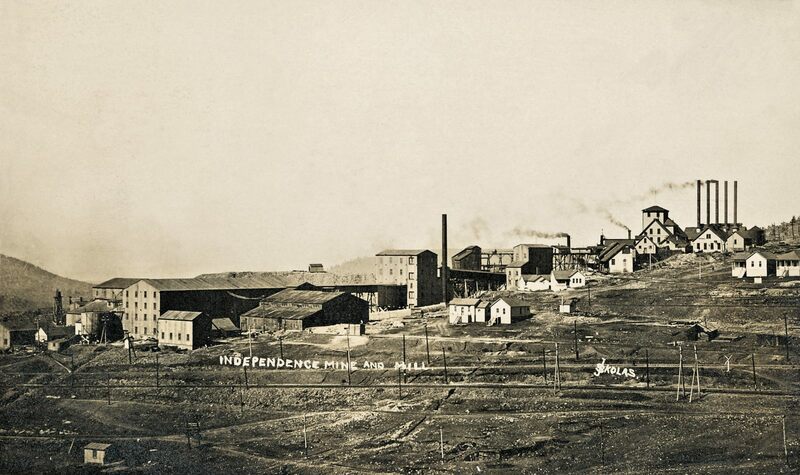 * Near upper right-hand corner is the trestle out from the Coalbins House of the Independence No. 1 Shaft structures seen, with the main structures of the mine behind the trestle and dump seen. This long distance shot of the Independence No. 1 shaft structures, is from a time before they built their massive mill in the area in the foreground, but after an experimental mill/ore-house was built at the end of the long-covered trestle seen in this view from what I've been able to gather. The tracks in the foreground is part of the Golden Circle trackage, but some further up the hill is the dual gauge tracks of the Golden Circle and the Midland Terminal tracks as they both served the ore-houses of this mine, both close by the main structures and at the large mill/ore-house almost at center of this view. My Collection; From page 53 in a 1901 book named Program of Trans-Mississippi Commercial Congress. Page 53; Program of Trans-Mississippi Commercial Congress - Cripple Creek, Colorado, July 16, 17, 18, 19, 1901 - Published in 1901. The Great Independence Mine Sold in England for $11,000,000. This long distance shot of the large complex known as the Independence Mine is taking looking west with Squaw Mountain background right. 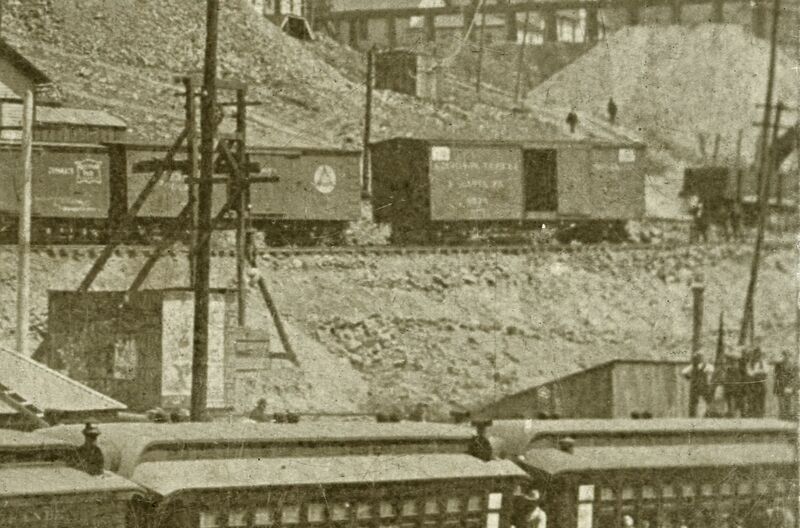 In the foreground bottom is the trackage of the Golden Circle with a large string of boxcars set out on a spur. About 1/3 from bottom and from right towards left is the location of the Midland Terminal trackage that was later connected with the Short Line trackage that might be running at the bottom of this view, outside the view I would then presume. 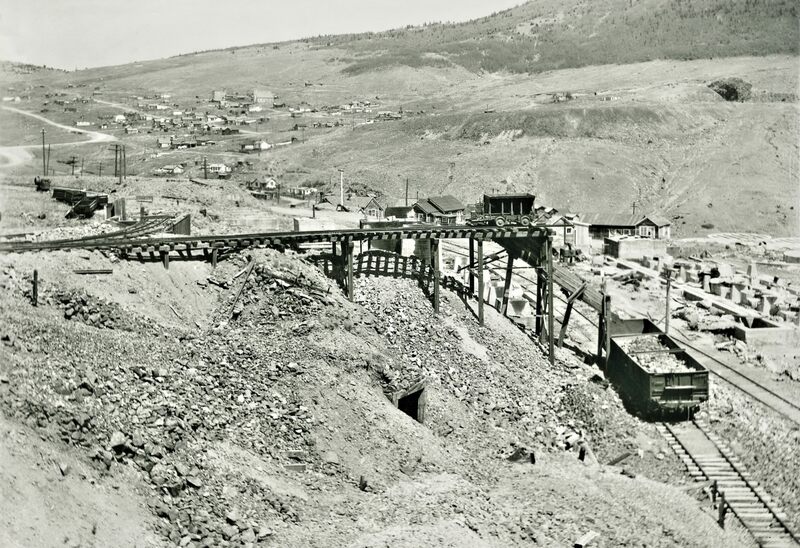 There is many structures and ore-houses at this mine, the one furthest to the left, attached with a long-covered trestle, was also an experimental mill I think. My Collection; View is from page 5 in the July 1902 edition of the Official Guide to Cripple Creek District. 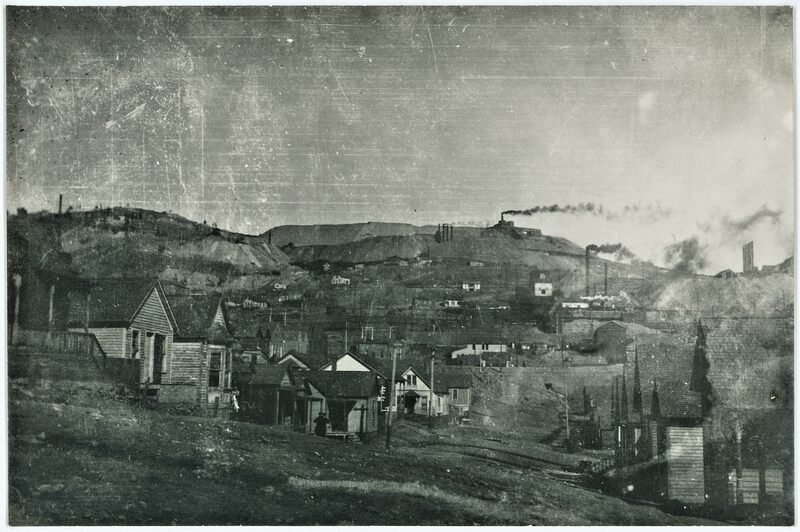 Page 5; Official Guide to Cripple Creek District, July 1902 (Vol. 1, No. 2) - Published in 1902.